When mankind's end begins, human survivors fight to secure a broken future. But others have been waiting for this day. Others see the death of humanity as their salvation, as a chance to gain dominance. We call those others vampires. To celebrate this year's Vampires for Valentines Giveaway Hop hosted by Felicity Heaton, I invite you for a glimpse into The Harvesting Series. Welcome to Hamletville, home of Layla Petrovich, heroine of The Harvesting Series. The Harvesting Series is not your typical zombie tale. Sure, mankind dies. Sure, humans become walking corpses. But they are not the only undead creatures lurking around. What if the vampires have been watching, and waiting, for this chance? How will you survive? The undead are troublesome. Unless their guts are hanging out of their stomach, it’s not always easy to determine if someone if undead or if they just really need a cup of coffee. After all, the undead need not be flesh eating zombies. There are many kinds of undead: vampires—sparkly or not–, windigo, ghouls, ghosts, etc. 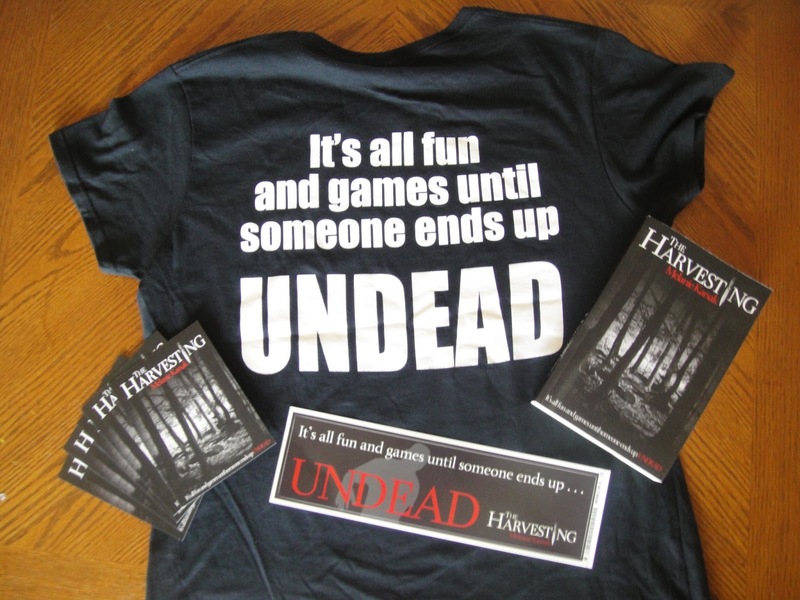 The good folks of Hamletville, the resident survivors of the “zompire” apocalypse in “The Harvesting,” have put together a checklist for you to determine that all important question: living or undead? 1. The individual is groaning and shuffling. Living or undead? This can be difficult to determine. Anyone intoxicated, studying for finals, or the parents of small children exhibit these features. To determine if they are living or undead, the residents of Hamletville suggest offering a snack. If the individual smacks it angrily away, they are living. Also, they are in a bad mood. Be advised. If they try to eat your hand, they are undead. 2. The individual is eating flesh. Living or undead? The answer to this conundrum depends a lot on the nature of the raw flesh. For example, if you are at your local Outback and the person has ordered a rare steak or burger, you’re probably okay. Watch for condiment choices. This is often a tell-tale sign. If they go for the A1 or ketchup, they are probably living. If, however, you arrive at your local Outback to discover the patrons eating one another, they are likely undead. 3. The individual is drinking thick, red liquid. Living or undead? A “Naked” brand fruit smoothie, a nice port wine, or blood? Tough one. Without trying the concoction yourself, it might not be 100% clear if the individual is living or undead. Since you’d have to be stupid to take a sip, the only other option you have is to check for tell-tale signs. The residents of Hamletville have noticed that zombies don’t seem to like beverage containers. Instead, they will drink directly from a human corpse sippy-cup. Vampires, however, can prove tricky. They love to be elegant, don’t they? They are always sipping champagne flutes full of O-negative. Don’t let these undead creatures fool you. There is almost one universal sign you can use to determine if someone is a vampire: are they hot? If they are hot and pale (maybe having sparkles), go cautiously. 4. The individual is frothing at the mouth. Living or undead? Is there a rabies outbreak in your local area? Does the individual suffer from road rage? Has the person just been slapped by Justin Bieber? Any of the proceeding may cause a living person to froth at the mouth. If, however, none of the above apply, assume the individual is undead. 5. The individual is ethereal. Living or undead? If you have seen Norman Reedus, you probably already know that the living can take on the glow of the celestial divine. A luminescent, other-worldly glow is not necessarily a sign that someone is no longer living. If you are uncertain, the residents of Hamletville suggest the following: first, determine if you can see through the individual. Not in a “I love him so much I can see into his very soul” kind of see-through, but more like “gee, you’re standing in front of that lamp, yet I can still see the lamp” kind of see-through. If you can see through them, they are undead. If you can’t see through them, but you still are not sure, the residents of Hamletville suggest that you next determine if the individual could be classified as a “slayer” of any sort: zombie-slayer, vampire-slayer, demon-slayer, etc. If so, they are probably the hero of your town or tale—unless the tale is written by M. Night Shyamalan—thus, they are probably amongst the living. The residents of Hamletville hope you find this checklist helpful. One final tip . . . always keep a nose out for the undead. They stink . . . like the undead. Like tales of the undead? Check out The Harvesting. The Harvesting is a dark fantasy novel that chronicles the z-day event from the perspective of Layla Petrovich. Layla, returning to Hamletville just as the world begins to die, finds herself struggling to protect the people of her small home town. But zombies are not her only problem. Layla soon finds herself in the middle of a battle for our middle earth. The Harvesting, the first novel in the series, is available at Amazon.com. “Some are épée, foils—you can tell by the hilt—a broadsword, a claymore, a katana, a scimitar, throwing daggers,” I said, pointing, “but this, this is a Russian shashka.” I pulled the shashka from the bundle. “It’s like a traditional sabre, but has no guard. She’s light, single-edged, wielded with one hand, and good for stabbing or slashing. Not awkward in close quarters like a Scottish claymore, but it will kill you just as dead,” I said with a smile. I unsheathed the weapon and gave it an under- and over-hand spin around my head, shoulders, and back. “Everyone pair up and start working with the training sabres,” I said and pointed to the sword rack. I went to my bag and grabbed my cell. The monuments on the Mall faded into the distance behind me as I made my way to my Georgetown apartment. It was Friday night. Wisconsin Avenue was packed. The upscale shops and restaurants teemed with people. In the crowd you could see the mix of international tourists, Georgetown students, and designer-dressed hotties headed to clubs. I sighed. For the last month I had turned myself inside out trying to get the attention of Lars Burmeister, the German specialist the Smithsonian had brought in to consult on our new medieval poleaxe exhibit. He had finally asked me to dinner; we were going to meet at Levantes, a Turkish restaurant near Dupont Circle, at nine that night. I had dreamed of authentic dolma and a chance to sit across from Lars somewhere other than a museum. I had even bought a new dress: black, strapless, come-hither. The apartment was ghastly hot. The small, one-bedroom had been closed up all day. I lifted the window and let the noise of the city fill the room. The street lamps cast twinkling light across my apartment. The weapons I had mounted on the wall, swords, shields, axes and the like, glimmered. I peeled off my sweaty practice clothes. Pulling a bag from the closet, I threw in several changes of clothes and a few other supplies. On my coffee table, my laptop light blinked glaringly. An overflowing email inbox, an article on bucklers that needed editing for a peer-reviewed journal, and a PowerPoint on Medieval Russian swords for a presentation for next week’s symposium all called me. My coffee table was stacked with paper. I was flooded with work; half my department was out on sick leave. There was a bad flu was going around. Thankfully, I had not yet gotten sick. I pulled my cell out of my bag. I stared at the phone for a moment; Grandma’s recent call was still displayed on the screen. I dialed Lars’ number. My stomach shook when he answered. “Gute nacht,” I said as sweetly as possible, hoping I had not pissed him off, and stuffed my phone into my bag. I stared out the window taking in the view. I did not want to go back, not even for a weekend. I loved my life. Hamletville was an old, ghost-filled place: too many memories, too much heartache. Yet I knew my grandmother. If she said I needed to come home, then I needed to come home. I closed the windows, slid on a pair of jeans, a black t-shirt, boots, and a light vest. I looked again at the display on the wall. At the center I had crossed two Russian poyasni or boot-daggers. One dagger had the head of a wolf on the hilt. The other had the head of a doe. I grabbed them and tossed them in my bag. I then headed back downstairs and into the night. It was the last time I would lay eyes on D.C. for many years. Thank you for a chance to win. I can't wait to try out your books. Just love new found authors.